Paul Davies. Author:Paul Davies. Language of text Product details: Wordery. Product details. Language of text:English. Competitive prices. counterfeits - ever! Disc may need to be cleaned. Tomb Raider Art book is new. Selling my Tomb raider artwork that came with the collection edition of the game. Binding: Hardback. Length: 240 mm. Width: 312 mm. Rise of the Tomb Raider, The Official Art Book by Andy McVittie. Author Andy McVittie. Title Rise of the Tomb Raider, The Official Art Book. Embargoed to 10th November, Simultaneous Release. Tomb Raider: The Art and Making of the Film by Sharon Gosling. A fan of all things fantasy, horror and sci-fi, Sharon Gosling is a UK-based writer of both non-fiction and fiction, as well as working as a pop-culture magazine editor and audio drama producer. 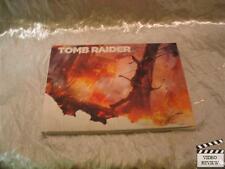 Tomb Raider Artbook Art Book. Online-Str​eitbeilegu​ng OS-Plattfo​rm. Datenschut​zerklärung. FOR SALE IS A USED ART BOOK. Rise of the Tomb Raider, The Official Art Book The Official Art Book by Andy McVittie 9781783299966 (Hardback, 2015). Language of text Product details: Wordery. Product details. Language of text:English. Shadow of the Tomb Raider The Official Art Book by Paul Davies. The Shadow of The Tomb Raider Official Art Book features exclusive concept art and developer interviews detailing the climactic conclusion of Lara Croft's origin story. This is in the original sleeve I bought it in from Kirk more than a decade ago. Lovely, delicate line work. Rise of the Tomb Raider : The Official Art Book, Hardcover by Mcvittie, Andy; Davies, Paul; Adams, Brenoch (FRW); Horton, Brian (INT); Hughes, Noah (INT), ISBN 1783299967, ISBN-13 9781783299966 Presents concept art, 3D renderings, and sketches of designs for landscapes, buildings, items, and characters from the video game "Rise of the Tomb Raider," along with commentary from the developers.